Thermal Constants of Substances is an authoritative reference for chemists and physicists in a wide range of disciplines. Provided as an eight-volume set, this reference provides critically selected and self-consistent thermal constants for all inorganic, simple organic, and metallo-organic substances studied — over 25,000 in all. Over 51,500 references are included for further information, with some literature dating back to the 1800s. Organized alphabetically and cross-referenced for convenience, this reference has a permanent home on the bookshelves of labs around the world. 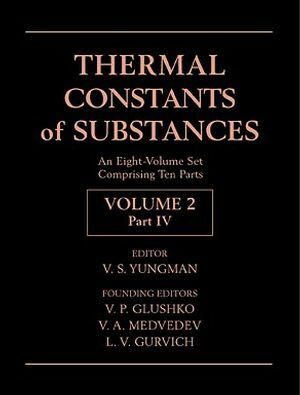 V. S. Yungman and V. P. Glushko are the authors of Thermal Constants of Substances, 8 Volume Set, published by Wiley. Elements: O, H, D, T, F, Cl, Br, I(J), At, 3He, He, Ne, Ar, Kr, Xe, Rn. Elements: S, Se, Te, Po. Elements: N, P, As, Sb, Bi. Elements: C, Si, Ge, Sn, Pb. Elements: B, Al, Ga, In, Tl. Elements: Zn, Cd, Hg, Cu, Ag, Au, Fe, Co, Ni, Ru, Rh, Pd, Os, Ir, Pt. Elements: Mn, Tc, Re, Cr, Mo, W, V, Nb, Ta, Ti, Zr, Hf. Elements: Sc, Y, La, Ce, Pr, Nd, Pm, Sm, Eu, Gd, Tb, Dy, Ho, Er, Tm, Yb, Lu, Ac, Th, Pa, U, Np, Pu, Am, Cm, Bk, Cf, Es, Fm, Md, No, Lr. Elements: Be, Mg, Ca, Sr, Ba, Ra. Elements: Li, Na, K, Rb, Cs, Fr.